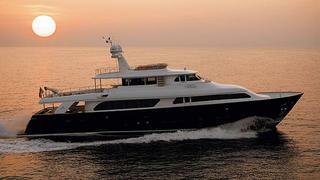 Mike Newton-Woof at Ventura tells me he's sold the 30m Ferretti motor yacht Ladies First to a direct client. A 2003 Custom Line Navetta, she recently had a full refit in Italy. Ladies First provides comfort and relaxation with features like a sauna and Turkish bath on the main deck, spacious alfresco dining areas and ample sunbathing spaces. Her major interior refit includes all her mechanical equipment and most furniture has been changed: new sofas, cushions, carpeting throughout the lower deck and convertible double bed in the sauna room. Accommodation for 10 guests comprises a master cabin with en suite bathroom and spa pool, a VIP cabin with double bed and en suite bathroom, plus a double and twin cabin, each with a Pullman berth. Ladies First was asking €2.5 million.